At The Auto Locksmith we offer a fast and reliable service for replacing lost vauxhall keys. We provide motorists with a Vauxhall car key replacement service that is guaranteed to be both super convenient and affordable. With hundreds of top class reviews all over the web you can trust The Auto Locksmith to supply your replacement Vauxhall keys. When you book The Auto Locksmith you get a speedy, mobile car locksmith service that will come to you and provide you with replacement Vauxhall car keys. Serving London and the Home Counties, our mobile car locksmiths have the experience and equipment to deal with all Vauxhall car models at a fraction of the cost of the garage or main dealers. Why trust The Auto Locksmith for your replacement Vauxhall keys? With so many companies offering the “same service” it can be difficult to know which auto locksmith company to book for replacing your Vauxhall car keys. We know price is important, but there are so many other factors to consider. We offer a competitive price, 12 months warranty, genuine Vauxhall keys, and a top level of customer service. Most importantly our customers are happy to recommend to us to others, so you can trust us to do a good job. Vauxhall produce two of the top 20 best selling cars in the UK, and with just under 118,000 Vauxhall Corsa’s on the road it’s no surprise that we have replaced hundreds if not thousands of Vauxhall keys over the last ten years. With experience comes knowledge and competence, which means we have seen pretty much every possible problem that can occur and always have a solution to ensure we can program Vauxhall keys without any exception. My Vauxhall key is broken do I need to replace it? Vauxhall keys are renowned for falling apart and breaking. If you key is broken it may be possible for us to make a quick repair rather than replace the whole key. Having said that it really does depend on the key as some Vauxhall keys still need to be replaced should they become broken or damaged. If you are looking for expert advice about common faults with Vauxhall keys take a look at our car key help and advice section, where we provide free in-depth advice articles and how-to videos. Such as this video on how to change the battery in a Vauxhall Corsa key fob. 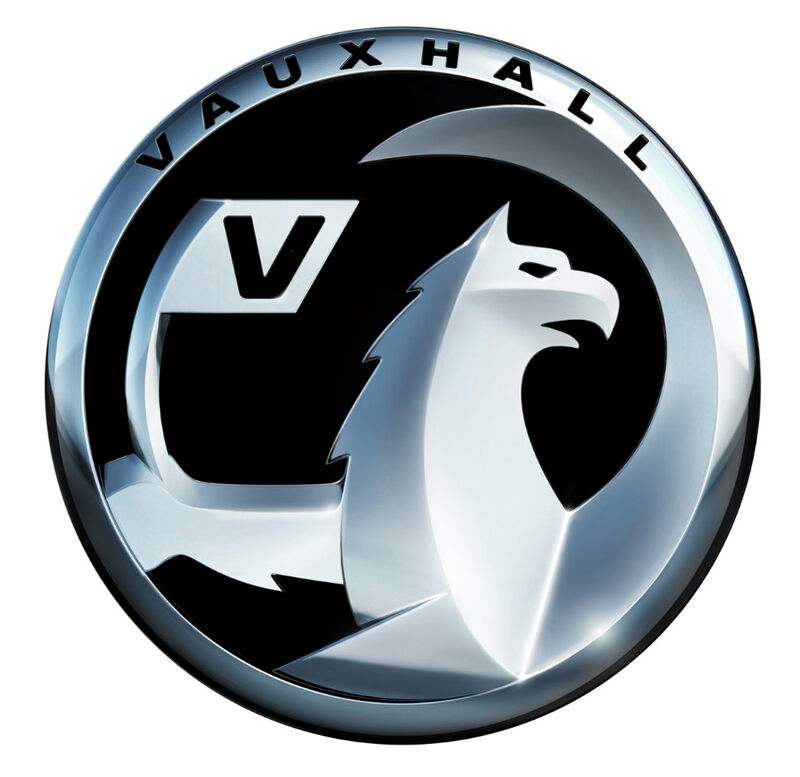 Vauxhall vehicles operate with a number of key types. A standard manual key will open the door and start the car when turned in the ignition. A remote locking Vauxhall key will do the same, with the added functionality of locking and unlocking the car from buttons on the key fob. There are a few variations of the blade profiles on each key type. It is useful to note that the original style remote keys supplied with the Astra H and Vectra C are no longer produced and have been superseded by new flip style key fobs. Our car locksmiths know this so there is no need to worry if your replacement Vauxhall key fob looks slightly different to your original. Both manual and remote locking keys contain a transponder key. This is not actually a key but rather a small chip concealed within the key that serves to deactivate the vehicle’s immobiliser box and allows the car to start. The transponder chip is now integrated into the remote PCB meaning only a remote key can be coded to the car and there is no chip to lose from the key when taken apart. The latest models of Vauxhall Insignia’s now use a proximity style key which allows the car to be started at the push of a button. We can provide these keys and program them to your Vauxhall, even when all keys are lost. Vauxhall cars are very popular in the UK so we frequently provide replacement Vauxhall car keys. We have invested in software that is able to extract the security code to reprogram keys to the car’s immobiliser box. In fact, The Auto Locksmith can provide the full range of remote lock type keys for all Vauxhall models. 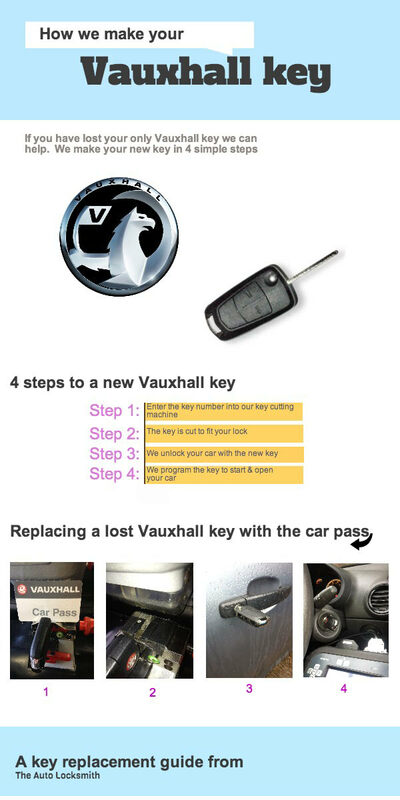 For replacement Vauxhall keys the two pieces of information required are the “key number” for cutting the key blade and the “security code” for programming the transponder chip and remote locking fob. This information is held on your Vauxhall car pass, a credit card sized piece of paper that is usually found in the front perspex of the black leather manual folder that is supplied with the car. Can you cut Vauxhall keys if I do not have the codes? You may have lost or misplaced this piece of information or never received it if the car was purchased second hand. Do not worry as our mobile locksmiths can still provide you with replacement Vauxhall keys – many other locksmiths are unable to do this because they have not invested in the specialist tools and equipment required to extract the required information. For early Vauxhall cars, pre 2004, we have two ways of making a key. We can extract the key number stored in the cars ECU, but if this is not possible we can remove a lock to see how the key needs to be cut. To program the Vauxhall transponder chip we use specialist software to extract the immobiliser code. However in the event this is not possible we can de-solder an e-eprom chip for the car’s immobiliser box to ensure the job gets done. On some newer models the key number is no longer stored in the cars ECU, in this case we use a tool to pick and read the lock. The Auto Locksmith is not just an emergency service so even if it is only a spare set of car keys that you require, we will still come to you and produce a new set of keys for you. We operate 24 hours a day, 7 days a week, 365 days of the year and we will not be beaten on price! You never know when you are going to have a problem with broken, lost or misplaced Vauxhall key. So if you live in, work in or are planning to visit anywhere in London and the Home Counties, do yourself a favour and make a note of The Auto Locksmith telephone number in advance or program it into your mobile phone. It will make solving the problem of replacement Vauxhall car keys in London much easier. The Auto Locksmith is at your service. I would like to thank The Auto Locksmith for their Vauxhall car key replacement service, which was both value for money and highly professional. My local Vauxhall dealer were nothing short of useless, I called four times for over 1 hours but never once did anyone pick up the phone to help. I searched online to see if there was any there option for replacing my lost vauxhall key and found The Auto Locksmith website. A lovely chap called Mark kindly explained how straight forward it would be to get new keys for my Insignia and he wasn't wrong. I am amazed at how simple he made it look. One very happy customer.